Daybreak Games is retiring H1Z1's survival game, Just Survive. In a letter on the official website, the post—simply signed off as The Just Survive Team at Daybreak Games—said the decision was a difficult one, and while there was plenty of promise and loyalty from its fans, there weren't enough people playing it to maintain development. "After careful consideration, we’ve made the difficult decision to sunset Just Survive on Wednesday, October 24 at 11am PT (7pm UK time). The excitement of the game’s promise was palpable and its loyal community is still full of ideas for its future. Unfortunately, we are no longer in a position to fulfill its greatness and the current population of the game makes it untenable to maintain." After a little history about the game's development and giving thanks to the "passionate players" who brought the "greatest stories", the post went onto confirm that Steam purchases and in-game transactions have already been suspended, and that the servers will go dark on October 24, 2018. "Thank you for taking the time to play the game, to help test it when we opened the Test servers to the public, and for all of the suggestions and feedback throughout Early Access. We truly appreciate everyone’s commitment and your contributions throughout the development process. Our promise is to do better and learn from every experience along the way." 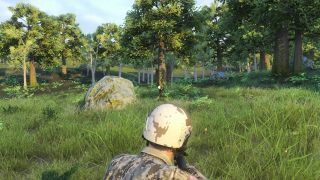 "Just Survive was part of our first Early Access project, and we learned a great deal during its development," the post said. "We hope everyone had amazing adventures across Pleasant Valley and Badwater Canyon." If you feel you might be entitled to a refund, Daybreak urge you to head here for more information. Despite being an early iteration of H1Z1, the closure of Just Survive will not affect the battle royale shooter, which became free-to-play earlier this year and is still receiving regular updates.